hey everyone! time for another field report from rachel of power cut jewelry (check out her etsy site for awesome vegan and beatles-related items!). 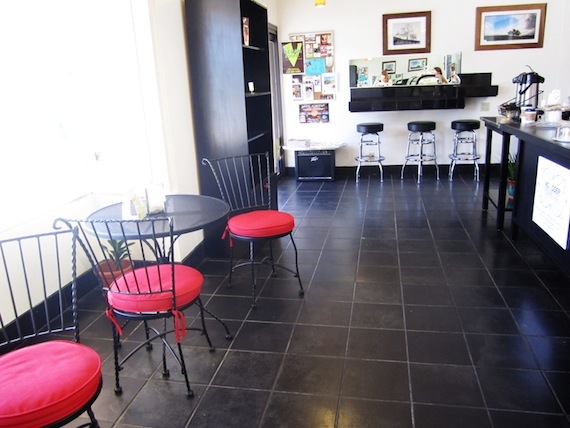 today she blogs about LA’s newest all vegan bakery, no udder desserts in woodland hills. check it out. I suffered through the LVUSD school system and I’ve been engulfed by a bubble called “the valley” my whole life. Besides Tom Petty songs that make me happy to be a valley citizen, I have a strong dislike of the place. It’s too hot, the people are conceited, rude and terrible drivers lurk everywhere. One of my favorite restaurants, Madeleine Bistro, is hardly open and most recently the only somewhat decent vegan Thai place began serving meat. Although I complain, the most important thing about the valley is that my dog loves it here. About two months ago, I randomly read about No Udder Desserts opening a storefront in Woodland Hills. 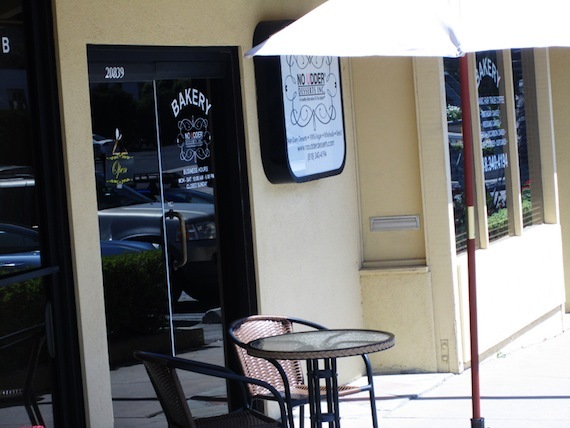 Started by Trisha Lobefaro a few years ago, No Udder Desserts has been sold at various places in the L.A. area and can now be found at a quaint little bakery smack dab in the valley. The umbrella is hiding the word "vegan", but it IS there! The shop is nestled in a little outdoor mall near a Target and Payless Shoes, it might be hard to find if you’re unfamiliar with the area, but luckily a sign reading “Vegan Bakery” adorns the main window. Inside is very small, with two tables and one outside the doors; although I didn’t eat inside, I can imagine sitting there with friends over some coffee and sweets would be quite nice. I first went here about a month ago and was pleased to see that many of the cake offerings were petit fours. They’re the perfect size for when you want to indulge, yet not overdo it. I left No Udder Desserts with a pecan bar which was delicious. I immediately told Quarrygirl that I wanted to do a field report on this place! I finally made it back to No Udder Desserts earlier this week, and got myself more than just one thing to try. 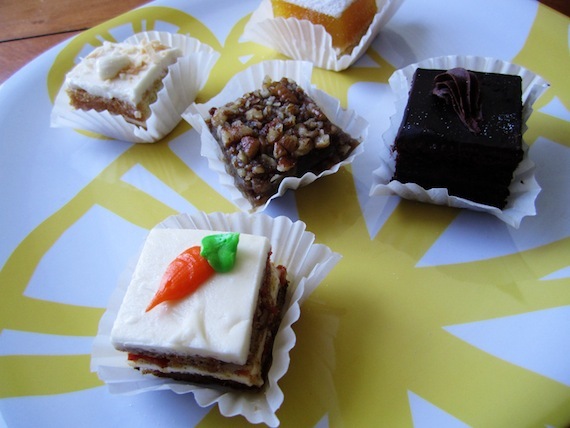 Various bite-sized cakes that caught my eye were carrot, coconut, and chocolate. I also tried a lemon bar, pumpkin “cheezecake”, whoopie pie, chocolate chip cookie and I couldn’t leave without another pecan bar.